The Video Solution for your Dealership You Have Been Looking For! It’s not every day I get overly excited about something new being introduced in our industry but I was recently introduced to an innovative solution that in my opinion is a real win for dealers. Not only can this solution be used to create “real” walk-around videos of your inventory, but can also be used for testimonial videos, follow-up communications, personal messages from your sales team and management and even to capture immediate service repairs in the service bay. This new service by Authntk enables dealers to create brand safe (ie. no more YouTube where your competitors advertise against you), customized video postcards for each and every potential customer. Let’s face it, most dealers struggle with writing effective emails. I read and review 100’s of dealer sent emails each month. And no matter how many times I train on AIUA, dealers continue to send customers the most impersonal, generic, un-motivating email (templated) responses. For years now, I’ve been saying dealers need an easy way to use video to immediately capture the customers attention while motivating them to engage. If crafting up a persuasive email isn’t your bag (as it’s not for most), then brush your hair, button up your shirt and get infront of a video camera. I sat down with Len for a quick Q&A around Authntk/Walkaround Videos. I know..some of these questions are very general but for the sake of word count I wanted to give a high level view of the product. If YOU have any questions, sound off in the comments. Jeff – What is Authntk/Walkaround Videos and what does it offer the dealer? Len – Walkaround Videos helps dealers personalize the buying experience at your dealership. The first thing they want is more information on the vehicle they’re interested in. What better way to show them you care about their business than to send them a personal video introducing yourself and a walkaround video of the vehicle they’re interested in? With our iPhone, iPad and Android apps, a walk around video of the exact vehicle that the customer has expressed interest in can be created and sent out in less than 5 minutes. These customized, personalized and dealer branded videos are sent to the prospect and tracked on our platform so that a dealer knows if the the video was watched. Imagine the difference the potential buyer feels when they get a templated email versus a personalized video! How’s that for differentiating a dealership from their competition! Jeff – What made you decide to offer a service like this? Len – My background is in web video. In fact, one of my prior companies provided the website walk-on videos to hundreds of dealerships. These videos were all about dealer’s personality and I wanted to bring a product to market that was super easy to use, fun for the buyer and used the power of video to help sell more vehicles. There’s also clearly a need. We like to say that ‘video is the new text’. People are tired of reading and nothing conveys more information, more quickly, with more emotion than video. I showed Walkaround Videos to a few dealerships just as we were getting started and they basically flipped out and bought on the spot. We knew we were on to something. As a car buyer myself, I was also really tired of the ‘Ken Burns’ effect of zooming in and out of a picture and having it be called video. Nobody is fooled by it and it’s not real video. We wanted to create a brand-safe, personalized experience for the buyer and the dealer. Jeff – You keep saying this is easy to use – how exactly does Walkaround Videos work? Len – It really couldn’t be easier. When a lead comes in, the sales rep simply walks to the lot with their mobile device (like an iPhone, iPad, iPod Touch or Android device), opens the Authntk app and begins recording a video of the requested vehicle. Once the video is complete, they enter the buyer’s name, email address and year, make and model of the vehicle and touch ‘submit’. The video is then uploaded to our servers where the Manager receives an email, reviews the video and then approves or rejects it with just a click. Once approved, our platform automatically creates a dealer-branded video email that can be mailed to the prospect. The entire process takes less than 5 minutes. 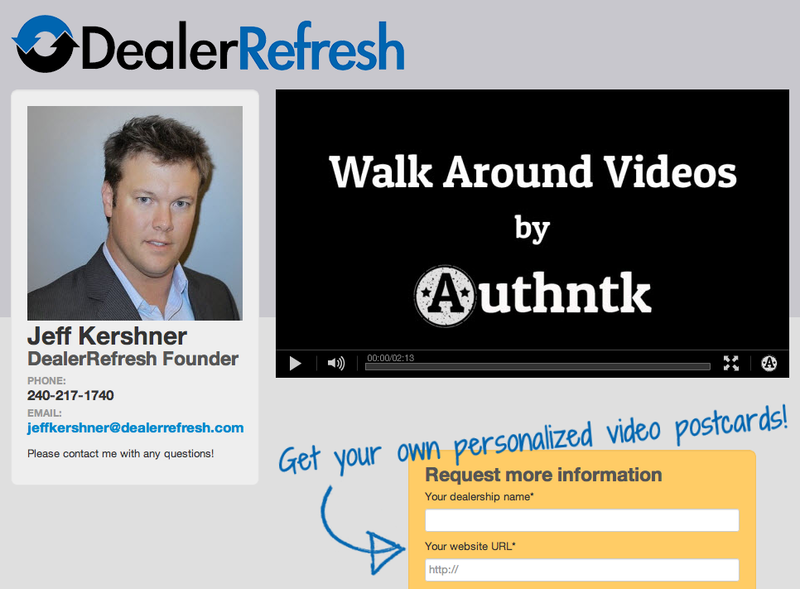 Jeff – Why would a dealer use Authntk Walkaround Videos over other video services available? Len – Until now, dealers have been given a poor choice for walk around videos. Either they could go through an unwieldy process and use YouTube, which meant no branding, no control, and competitive advertising, or they could send the customer a ‘stitch video’ with zooming in and out of still pictures. Neither of these options are compelling to the dealer or the prospect. Using our easy-to-use app, dealers can now truly personalize the first experience that a buyer has with them in a brand-safe and fun way. We’ve already briefly discussed generic and non-compelling templated emails. Imagine what happens when a prospect gets a video email, branded for the dealership? It creates what we like to call a ‘warm introduction’ so that when the prospect walks into the dealership, they feel they’ve already met the sales person. Jeff – What else can the Authntk platform do? Len – In addition to Walkaround Videos, Authntk is a video capture and hosting platform. We’ve got dealerships using us in a number of different ways. First is for video testimonials. Let’s be honest. Text is boring. The most excited customer can add a few exclamation points, but that’s about it. Using video brings sight, sound, motion and most importantly, emotion to your site. We enable your customer’s to tell their story to your visitors. Another use is in the service department. Just like using Walkaround Video to sell cars, you can use also video to show your customers exactly what work needs to be completed. More customers say ‘yes’ if they understand what you’re doing to their vehicle. You can even add coupons to the video email as extra incentive! Finally, every dealer needs to get vehicles off their lot. Create a weekly video special to promote that car to more buyers. We make the process so easy that you can change your specials every day if you want! Len – Selling cars isn’t easy, and the Internet has really made it difficult for dealers to distinguish themselves. From a buyer’s perspective, another dealership is just a click away. Dealers need a way to immediately capture the customers attention and differentiate themselves from their competition. Video does that, especially when everyone is sending the same text-based auto-response emails. Be different, and with more people consuming video, dealers can use this ‘zero moment of truth’ to show the prospect how much they want their business by creating a personalized video just for them. There is no better way for a prospect to feel connected to the vehicle they inquired about than to have a video of it in their inbox. Dealers using our platform are driving more prospects into their showrooms and selling more cars. It’s as simple as that. If your dealership hasn’t fully embraces video yet, it’s time and it’s only a matter of time before the competition does as well. Jeff – Len, thanks so much for taking the time to answer a few questions for the DealerRefresh community. You already know how excited I am about this – so much so I have partnered up with Len to help get the word out and show dealers how easy and effective Authntk/Walkaround Videos can be. If you have any additional questions, sound them off in the comments and either myself or Len will be here to answer. I really like the concept here of simplifying video communication. I recently spoke with the good folks at Autntk and feel like there’s something there, but I don’t get the feeling there’s a finished product yet. If I already have a webcam and am making my own video in windows movie maker, the only thing I’m getting for my monthly investment is the ability to shoot with my mobile device and have a more instant upload to the streaming service. Yes, the player is a nice touch, and the reporting is valuable. But if I want to do any editing, I’m going to have to download the video and upload again when I’m done. This process is basically the same as what I’m able to do now, for free. The way I see this being successful, is if it worked like Jing. Shoot your video and instantly get a link back to insert into your email. If the BDC agent or salesperson has to do anything more than shoot the video, they’re simply not going to use it as much as they should. In short, this is a service that has a lot of value and dealers need. This specific solution needs a little more polish and needs to further simplify the process before it makes sense to spend any money on. I’m anxious to see how this product evolves. I appreciate the time you spent with me on the phone yesterday. Interesting comments, but I’d respectfully disagree with your assessment that you can do most of this yourself and that the only thing you’re getting for your monthly investment is the mobile upload. You’re leaving out the simplification of sending the videos to your customers, the dealership and sales rep branded communication, the moderation, etc. For example, how are you sending the video? If you’re embedding it in an email, then there is a good chance it won’t be received by the recipient (the file size is way too big). How do you personalize each email for each of your reps so that the video is embedded in it and it looks like a video postcard? Where do you host the video if you’re not just sending embedded via email? If you’re putting it on YouTube, you know that your competitors are advertising against you and you’re sending your customers away from your dealership. How are you tracking that the video was viewed? There is no way to do the above unless you have a platform that hosts and serves the videos, like Authntk. It really is as easy as having the salesperson shoot the video and hit submit. From there, the sales manager is alerted via email to review the video and then they can approve it and can email the link to the prospect. Quality control is a requirement for many of the dealers we’ve talked to. The point of Authntk is that we want to make the process super simple, and we’ll continue to evolve and enhance our platform to that end. Editing is another whole issue and to your point, something that no BDC agent or salesperson is going to do. In my experience, prospects don’t expect fully polished, studio production quality video. I believe that they just want to see the vehicle and have some kind of information on the salesperson who they’ll be meeting so that when they walk in to the dealership, they feel like they’ve already met. Relationships really do sell more vehicles. Let me again say that I like your product. I like what you’re doing, and I do see the value in what you are offering. As it stands, I can upload videos to any number of free services like screencast. They allow for private hosting and give me the ability to simply send a link to a customer in an email so there is no embedding. Youtube has it’s downside, but files can be made private there as well. Your platform does provide extra branding and the ability to create a personal relationship with the customer by putting his/her picture beside the video. There are many things I like about your product. In fact, your product is the only one I’m aware of that is even attempting to do something like this. Simply put, I like where you’re heading, but I think it’s a little clumsy at the moment and it’s not quite there yet. Maybe it’s me. This is one man’s opinion. I know you talk to many dealers, and if I’m the odd man out then then I’ll just have to wait for someone to create a product that is more in line with what I’m looking for. It’s all good. As we discussed, we’re focused on making video as simple and easy as possible. We have begun integrations with other automotive platforms as well, so keep an eye out for those. Good discussion and if you have other ideas for us, please send them along. We’re building a platform auto dealers so the more input from the industry, the better. It’s all good. As we discussed, we’re focused on making the process as simple and easy as possible. We have begun integrations with other automotive platforms as well, so keep an eye out for those. Good discussion and if you have other ideas for us, please send them along. We’re building a platform for auto dealers, so the more input from the industry, the better. In mid 2007 I finally registered the domain AutoVideoQuote.com because having been the ISM for about 7 years at that time, I thought video was a great idea – despite not too many auto pros at the time being in agreement with me, including some DR people. But I saw the need early for personalized video responses to set oneself apart, and video is simply like nothing else, the next best thing to being there. After looking at the architecture behind this new product, it’s exactly what I envisioned, but never got going myself. Perhaps we can partner up – who wouldn’t love to send out AutoVideoQuotes? Nobody else is! This is why I love the car business, so many great minds constantly at work. This post sort my query which i am looking for. Thanks for the author for this nice post. Mike, I realize it’s probably been a couple of months since we’ve been in touch, but I just noticed this comment and realized that we’ve got a ton of new functionality since we last spoke (automatic fully-formatted HTML email, automatic texting to mobile numbers, etc. Contact us if you’re interested in seeing how our product has evolved!